Subject: U.S./1941- 1945; World/WWII; SEL: Courage in War; Moral-Ethical Emphasis: Trustworthiness; Citizenship. MPAA Rating: R for intense prolonged realistically graphic sequences of war violence, and for language. Length: Film Clip: 29 minutes. This Snippet Lesson Plan is designed to supplement existing lesson plans on the invasion of Nazi-occupied Europe at Normandy, June 6, 1944. Consider pairing this film clip with the movie Flags of Our Fathers (135 minutes), which shows the heroism of the U.S. Marines in the face of murderous crossfire from dug-in Japanese positions on Iwo Jima. That film also shows an example of the savings bond drives through which the government financed much of the Second World War. In addition, Flags of Our Fathers is a platform for discussions about the meaning of heroism and celebrity. If there is time for using only one of these resources, TWM recommends Flags of Our Fathers as an educational experience with more depth than just showing a clip of the landings on Omaha Beach. See Why Not Use the Whole Movie in Helpful Tips below. Students will have a vivid impression of the carnage endured by U.S. troops in the Normandy invasion and the sacrifices for their country made by young men during WWII. It is beneficial for students to have an understanding of what happens to soldiers in battle and the sacrifices made by young Americans to win the Second World War. The segment of the Omaha beach landing ends 29 minutes into the movie. Teachers can start the clip at the beginning of the film. Thee minutes can be saved by cueing the movie to start when the beach barriers are shown for the first time. Stop the movie when the scene of shifts to women working in an office. In 1942, General Dwight Eisenhower, Supreme Allied Commander in Europe, wrote that Germany should, “beware the fury of an aroused democracy.” On D-Day, June 6, 1944, the Allies mounted the largest amphibious assault in history and opened a third front in Europe. The invasion force consisted of more than 5,000 ships, 1,200 warships, and 13,000 airplanes. Some 90,000 U.S., British, Canadian, and Free French troops landed on the beaches of Normandy, while about 20,000 more came by parachute or glider. More than a million men followed in the succeeding weeks. The invasion had been in preparation for a year. Casualties turned out to be less than expected except at Omaha Beach, where strong German resistance and difficult seas resulted in about 2,000 U.S. casualties. By June 11, 1944, the Allied forces had linked up and made a solid front. The success of the Normandy invasion was crucial to the Allies. By the same token, defeating the invasion was vitally important to the Germans. Hitler is reported to have said: “The destruction of the enemy’s landing is the sole decisive factor in the whole conduct of the war and hence in its final results.” But the Germans couldn’t stop the invasion. In 1943, they were fighting the Americans and British in Italy and the Mediterranean as well as the Russians in the East. The Atlantic Coastline from Holland to France was 6,000 kilometers. It could not be watched in all places. In short, the Germans were overextended. Three weeks after D-day, one million men had been put ashore, along with an astonishing supply of 171,532 vehicles and 566,000 tons of supplies. “As far as you could see in every direction the ocean was infested with ships,” Ernie Pyle [the great WWII war correspondent] observed, but when you walked along the beach, a grimmer picture emerged. “The wreckage was vast and startling.” Men were floating in the water, lying on the beach; nearly nine thousand were dead. “There were trucks tipped half over and swamped … tanks that had only just made the beach before being knocked out … jeeps that had burned to a dull gray … boats stacked on top of each other. On the beach lay expended sufficient men and mechanism for a small war. They were gone forever now.” No Ordinary Time by Doris Kearns Goodwin, 1994, Simon & Schuster, New York, page 511, quoting from Pyle, Brave Men pp. 358, & 367 – 69. Mr. Pyle was amazed that the Allies could afford these losses, but he realized that behind the men, the vehicles and the ships, were still more in preparation to overwhelm Germany. German resistance was unexpectedly light, except at Omaha Beach. Start the clip at the beginning of the film or, three minutes into the film, at the first appearance of the landing craft. Stop when the scene shifts to women in an office. Some notable exceptions to authenticity are that there was air support, but it was not as effective as modern-day air-support, and the officers hid their insignia of rank with mud or scarves to avoid being picked off by enemy snipers. German casualties (dead and wounded) on D-Day were around 1,000 men while the Allies lost 4,414 confirmed dead and another 6,500 wounded; however, the Allied effort established the beachheads and, after very hard fighting in the next several weeks, the battle of Normandy ended with a complete Allied victory. The order of battle worked out in advance by the generals was that the troops would be provided with bulldozers and tanks to make a frontal assault on the German beach defenses. The bulldozers and tanks didn’t make it to Omaha Beach, and the lieutenants and non-commissioned officers on the ground had to improvise in order to avoid being annihilated. Without orders from their superiors, they infiltrated men behind the German gun emplacements and attacked from the rear. That is how Omaha Beach was cleared of resistance. Do the men who died on Omaha Beach so that you can live in this country at this time make a claim on you? If so, what is that claim? A good discussion will include the following: The dead at Omaha Beach and in all the wars that have been fought to protect the country make claims on us all. That claim is to be the best people we can be so that their sacrifice will not have been in vain. That is how we earn their sacrifice. The dead cannot make a claim for vengeance against the Germans who were killing them at Omaha Beach because that will only result in an endless cycle of violence. The way that we can validate their deaths is to earn their sacrifice by the way in which we live our lives. SPR: Historical & Tactical Analysis (fm PE Forum). This Snippet Lesson Plan was written by James Frieden. It was published on July 5, 2015. Thanks to Steve Jessen, a history teacher at Palisades Charter High School in Los Angeles, for suggesting this film clip. The clip begins at the start of the film and runs for 29 minutes until the scene shifts to women in an office. Alternatively, the clip starts about 3 minutes into the film at the first shot of the beach barriers. This snippet shows many young men dying in a war zone, dismembered bodies, arterial bleeding, etc. WHY NOT SHOW THE WHOLE MOVIE? 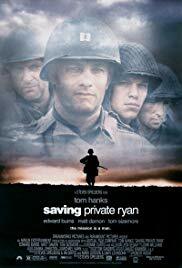 The rest of Saving Private Ryan is not particularly historically accurate and several scenes are horrifically violent. The worst is when, after a struggle, a German soldier looking to be in his 30’s overpowers a young GI and lovingly and slowly kills him by pushing a knife into his chest. The two hours and twenty minutes of the movie after the scenes of Omaha beach are beneficial only because they lead up to the last lines uttered by Captain Miller before he dies when he tells Private Ryan to, “Earn this. Earn it.” Teachers can achieve the same benefit without taking up several hours of class time through the Class Discussion Prompt set out below.